2006年9月 效能提升；發布Tomboy（英語：Tomboy (Software)）筆記本程式、Baobab磁碟儲存份額管理、Orca（英語：Orca (assistive technology)）螢幕閱讀器、GNOME電源管理器；螢幕保護全螢幕預覽；Totem和Nautilus的改善；Metacity支援多源圖像合成；新的圖示主題；基於GTK+2.10有新的列印對話方塊及API. 2010年3月 Nautilus、Empathy、便簽、Evince PDF閱讀器、Time Tracker、Vinagre VNC用戶端和Epiphany瀏覽器的改進；iPod and iPod Touch裝置可以libmobiledevice透過gvfs使用；使用GTK+ 2.20. ^ GNOME Languages. Ohloh. Black Duck Software. [May 22, 2014]. ^ Day, Allan. GNOME 3.28 Release Notes. The GNOME Project. [May 22, 2014]. ^ Introducing GNOME 3.12. You Tube (video). Google. 2014-03-26 [2014-07-02]. ^ Clinton, Jason D. GNOME 3: Fewer interruptions. The GNOME Project (video). YouTube. 2011-04-02 [2011-04-07]. ^ GNOME census (PDF), Neary, （原始內容 (PDF)存檔於2012-01-20） . ^ Staring into the abyss. Gnome. 2012-07-27 [2014-03-15]. ^ Klapper, Andre. Re: GNOME -> Gnome. GNOME marketing list (郵寄清單). 6 April 2010 [26 March 2017]. ^ About Us | GNOME. [2013-03-10]. ^ The GNOME Project: "GNOME Foundation Guidelines on Copyright Assignment 網際網路檔案館的存檔，存檔日期2012-03-04.". Accessed March 26, 2013. ^ Stallman, Richard Stallman. Stallman on Qt, the GPL, KDE, and GNOME. 2000-09-05 [2005-09-09]. ^ Re: GNOME -> Gnome. [2011-12-10]. ^ 16.0 16.1 16.2 Hoffman, Chris. How GNOME 3.14 is winning back disillusioned Linux users. PC World. IDG TechNetwork. [2015-04-05]. ^ Tozzi, Christopher. Open Source GNOME 3 Desktop Environment Wins Back Fans. The VAR Guy. Penton. [2015-04-05]. ^ Michael Larabel. Eight Interesting Improvements In GNOME 2.22. phoronix. 2008-01-29 [2008-01-30]. 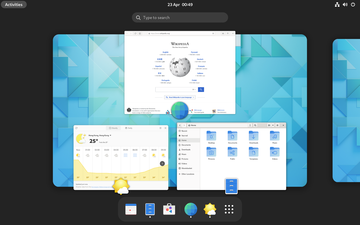 ^ GNOME 2.22 Release Notes. ^ Untz, Vincent. Celebrating the release of GNOME 2.26!. gnome-announce-list (郵寄清單). 2009-03-18 [2009-03-18]. ^ Holwerda, Thom. GNOME 2.30 Released. OS News. 2010-03-31 [2010-04-04]. ^ GNOME 2.32 Release Notes. [2010-10-31]. ^ GNOME 3.0 Release Notes. [2011-04-07]. ^ Wallen, Jack. GNOME 3.10 has resurrected what was once the darling of the Linux desktop. TechRepublic. 2014-03-28. （原始內容存檔於2014-03-28）. ^ GNOME 3.20. March 23, 2016. ^ GNOME 3.22 Release Notes. ^ GNOME 3.24 Release Notes. ^ GNOME 3.26 Release Notes. ^ GNOME 3.28 Release Notes. ^ GNOME 3. The GNOME Project. [2014-06-12]. ^ 33.0 33.1 Terminology for Gnome Shell. GNOME Wiki. The GNOME Project. [2014-05-22]. （原始內容存檔於2014-05-22）. ^ 34.0 34.1 Day, Allan. GNOME 3.10 Release Notes. The GNOME Project. [2014-05-22]. ^ GNOME 3 Cheat Sheet. GNOME Wiki. The GNOME Project. [2014-06-13]. ^ GNOME Shell Design. The GNOME Project. [2011-12-03]. ^ Day, Allan. GNOME 3.8 Release Notes. The GNOME Project. [2014-06-13]. ^ Vitters, Olav; Klapper, André; Day, Allan. GNOME 3.2 Release Notes. The GNOME Project. [2011-10-05]. ^ Peters, Frederic. 20121104 meeting minutes. release-team (郵寄清單). 2012-11-06 [2014-06-12]. ^ Pennington, Havoc. Free Software UI. April 2002 [2011-12-04]. ^ Applications - GNOME. GNOME. The GNOME Project. [2015-07-13]. ^ Matthias Clasen. GtkInspector Author's blog entry. 2014-05-15 [2014-05-17]. ^ GtkInspector in GNOME wiki. 2014-05-15 [2014-05-17]. ^ Bergius: Flowhub and the GNOME Developer Experience. 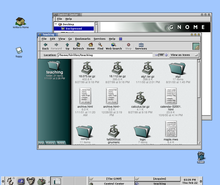 LWN.net. 2014-05-02 [2014-05-24].